El presente artículo estudia la relación entre los estilos de aprendizaje en el aprendizaje de lenguas y la cultura educativa en Rumanía antes y después de la caída del régimen comunista. La muestra consta de 204 estudiantes rumanos de español lengua extranjera en Madrid. Para medir los estilos de aprendizaje, se utilizó el Cuestionario Honey Alonso (CHAEA). La cultura educativa, entendida como un conjunto de comportamientos, creencias y actitudes con respecto al proceso de aprendizaje, se analizó utilizando el Cuestionario de Cultura Educativa (CCE) basado en la teoría y el modelo de las dimensiones culturales de Hofstede (1986, 2001). Se encontraron cambios significativos en la cultura educativa y estilos de aprendizaje dominantes entre ambos períodos, revelando entre otras una disminución del número de teóricos y reflectores en el aula de lenguas y una correlación entre reflexión, participación oral y períodos. Palabras clave: estilos de aprendizaje, cultura educativa, dimensiones culturales, educación comunista, aprendizaje delenguas. The present article studies the relation between learning styles in language learning and educational culture in Romania before and after the fall of the communist regime. The sample consists of 204 Romanian students learning Spanish in Madrid. To measure learning styles, the Cuestionario Honey Alonso (CHAEA) was used. Educational culture, understood as behaviors, beliefs and attitudes with respect to the learning process, was analyzed using the Cuestionario de Cultura Educativa (CCE), based on the cultural dimensions theory and model by Hofstede (1986, 2001). Significant changes were found in educational culture and dominant learning styles between both periods, revealing among others a decrease of the number of theorists and reflectors in the language classroom and a correlation between reflection, oral participation and periods. Keywords: learning styles, educational culture, cultural dimensions, communist education, language learning. Adult Education Centers all over Europe commonly offer language courses for immigrants. The attending students come with their own learning experiences acquired throughout their different training phases within the education system of their respective countries. These experiences are defined, to a great extent, by the kind of education and educational patterns which, at the same time, have been reshaped by cultural assumptions and expectations. In these influences two important aspects are at stake, i.e. educational culture and learning styles. Educational culture involves beliefs and attitudes about the learning/teaching process, in particular the values, preconceptions and ideas about what must or must not be done, what is correct or desirable, what is expected or not from the learning experience. More in general, the field of education can be greatly influenced by culture in areas such as the philosophy of learning, curriculum designs, classroom dynamics, teacher/learner relationships or teaching methods and styles. On the other hand, apart from genetic conditionings, the way in which one learns derives from the way individuals have lived and have been taught. Preferences for different ways of learning are included within so-called learning styles, which can also encompass ‘characteristic modes of perceiving, remembering, thinking, problem-solving, and decision making, reflective of information-processing that develop in congenial ways around underlying personality trends’ (Messick, 1994: 122). Learning styles may be influenced by educational culture. Perception of the learning experience throughout one’s life can be affected by style in that it selects those memories which either confront or adjust to the learning style characteristics. As Alonso and Gallego (2006) claim from a phenomenological perspective, learning styles characteristics are surface indicators of two deep levels in the human mind: the entire system of thought and the individual qualities of mind which establish links with reality. It makes sense, for instance, that active learners remember especially the teacher who used to teach through games and experience as their approach meets his learning preferences. The present article studies the relation between learning styles during language learning and educational culture in Romania before and after the fall of the communist regime, the central research question being the following: is there a significant difference between learning styles in language learning of Romanian students of Spanish as a foreign language before and after the fall of the communist regime, and between those learning styles and Romanian educational culture in the same periods? We will present respectively the theoretical framework of our study, its methodology, the analysis of the data, and the final discussion and conclusions. In this study, culture is understood following the definition coined by House and other authors in their GLOBE study: ‘shared motives, values, beliefs, identities, and interpretations or meanings of significant events that result from common experiences of members of collectives that are transmitted across generations’ (House, Hanges, Javidan, Dorfman & Gupta, 2004: 45). Power distance, which deals with the perception of power, authority and social inequalities. Individualism versus Collectivism, which measures the relation between individuals and groups. Masculinity versus Femininity, which measures the emotional and social implications of gender. Uncertainty Avoidance, i.e. the ways of dealing with uncertainty and ambiguity, how to control aggressiveness and express emotions. Long Term Orientation (orientation toward the future rather than the past or the present). The GLOBE study extends Hofstede´s dimensions by adding others such as Performance Orientation, Human Orientation, Assertiveness and Gender Egalitarianism. For a detailed discussion of the pros and contras of the different versions of and criticism on the Hofstede model, see Morera Bañas, I., Buyse, K., McGinity, M., Gallego Gil, D. (2016). Learning styles encompass a series of theories suggesting systematic differences in individuals' natural or habitual pattern of acquiring and processing information in learning situations. A core concept is that individuals differ in how they learn. Leite, Svinicki & Shi (2009) state that one of the most common and widely used categorizations of the various types of learning styles is Neil D. Fleming's VARK model which classifies learners in visual, auditory, kinesthetic or tactile and reading-writing preference learners. Grasha & Reichmann (1975) elaborated a Learning Style Scale in order to analyze the attitudes of students and how they approach learning. The concepts of various learning styles are avoidant, participative, competitive, collaborative, dependent and independent. The objective of this model was to provide teachers with insight on how to approach instructional plans. In the last 25 years, comparative studies using Kolb´s LSI (Learning Style Inventory) found significant differences in learning styles preferences among samples from different countries (Auyeung & Sands, 1996; Barmeyer, 2004; Fridland, 2002; Hoppe, 1990; Yamazaki, 2005). These studies have produced significant results on the impact of culture on learning style preferences. Learning style variations are explained in relation to differences in the cultural dimensions among countries. Auyeung & Sands (1996) attribute the preference for concrete and active modes to the individualistic nature of Australia, whereas in Hong Kong and Taiwan the authors relate the preference for reflective and concrete modes to the collectivist nature of these countries. Hoppe (1990) suggests that reflection relates to uncertainty avoidance. Joy & Kolb (2009) used the GLOBE questionnaire to establish relations between the cultural dimensions and learning styles and also to classifie learning styles according to a learning cycle divided into four parts, which comprises the following phases: concrete experience, reflective observation, abstract conceptualization and active experimentation. In other words, since culture influences cognition and information processing (Earley & Ang, 2003, cit. Joy & Kolb, 2009), there is reason to believe that differences in cultural socializing tend to influence learning preferences and to produce different learning styles (Reynolds, 1997; Wilson, 1971, cit. Kerr, 2004). Even memories can be influenced by context and culture. Arbeláez (2002) states that it is not possible to build single and pure memories, but that they are built from a context made up of representations defined and delimited by cognitive processes which at the same time are affected by how cultural traditions of each social group have organized reality and what the individual´s context favors. On the other hand, the way we perceive and learn depends on our way of being, our personality, our system of ideas, our interests and preferences, and on peer pressure. All these elements have been widely used by psychologist and educators to determine aspects of personality and learning styles (Kagan, 1965; Myers, 1962; Witkin et al., 1971). Curry (1983, 1987) proposes a model of learning behavior, using an onion as a metaphor differentiating three different levels or layers: “instructional preferences”, “social interaction” and “information processing”; at the heart of the onion he places what he calls “cognitive personality style”, a relatively permanent personality dimension. Honey and Mumford's model, the Learning Styles Questionnaire (LSQ), is directly derived from Kolb's theory. However, they found that Kolb's LSI had low face validity with managers. Rather than asking people directly how they learn, as Kolb's LSI does, Honey and Mumford gave them a questionnaire that probes general behavioral tendencies. Their reasoning is that most people have never consciously considered how they really learn (Clark, 2011, para. 2). While basically the same as Kolb's model, there are two mayor differences. First, Honey and Mumford replace the terms “activist” by “accommodators” (active experimentation), “reflector” by “divergers” (reflective observation), “theorist” by “assimilators” (abstract conceptualization), and “pragmatist” by “convergers” (concrete experience). Secondly, they also postulate that people prefer different methods of learning, depending upon the situation and their experience level, thus they move between the four modes of learning, rather than being dominantly locked into one mode. It is on these aforementioned ideas that are based the three questionnaires discussed here, i.e. Learning Styles Questionnaire (LSQ), the Cuestionario Honey Alonso de Estilos de Aprendizaje (CHAEA) and the Cuestionario de Cultura Educativa (CCE). Alonso & Honey (1992) selected the Honey´s Learning Style Questionnaire (LSQ) as the basis for their questionnaire, called Cuestionario Honey Alonso de Estilos de Aprendizaje (CHAEA). They translated and adapted LSQ to the Spanish academic context adding a section with socio-academic questions. Studies in Spain, South America, United States, Canada, Australia, Great Britain, France and Holland used the CHAEA in order to analyze the predominant learning styles among samples of students from different educational levels, specialties and backgrounds (Aleida & González, 2010; Anido, Cignacco & Craveri, 2009; Madrid et al., 2009; Nevot, 2009; Ortiz & Canto, 2013; Pikabea, 2009; Santos, 2013; Zapata & Flores, 2008; to mention just a few). However this paper is the first to use this questionnaire to examine the connection between learning styles and culture. The Cuestionario de Cultura Educativa or CCE (Morera, 2010) is drawn up on the basis of Hofstede’s findings on the impact of culture on learning (Hofstede, 1986; 2001). It is intended to measure behaviors, attitudes and beliefs within each cultural dimension in the educational context by establishing two poles for each of the five dimensions of Hofstede, corresponding to the higher and lower dimension level respectively. The questionnaire consists of 35 items, 7 in each dimension (see figure 1 for the –in this study- most significant items). The CCE asks the respondents to mark on the scale their experience. However, not all the students, when recalling their learning experience within the education system, perceived it in the same way. Their memories were influenced by their own personalities and learning styles. Memories are mental representations, patterns in the brain which represent something to this owner´s brain (Sperber, 1996). These representations are understood as physical or symbolic ways of accounting for something real in its absence. They are ´organized, attitudinal, procedural and conceptual structures which may make sense of the environment´ (Arbeláez, 2002, section “Proceso de construcción de la representación”, para 1). In the following paragraphs we will outline the methodology of our study, in which two of the aforementioned questionnaires are used. The sample of our study consists of 204 Romanian students learning Spanish at the Adult Education Centers (CEPAS) in Madrid along with other institutions such as Centro Hispano Rumano, FEDROM (Federation of Romanian Associations in Spain) or Alcalingua, the Center for the learning of Spanish as a Second Language of the University of Alcalá de Henares. Overall, 14 centers participated. After filtering the sample in order to validate it, 189 respondents were selected out of the 204. Those questionnaires which showed inconsistencies in the answers or were incomplete, were taken out. Two independent questionnaires were used to determine the relation between educational culture and learning styles during language learning, i.e. Honey and Alonso’s learning style questionnaire (CHAEA) and our own Cuestionario de Cultura Educativa (CCE), which was sent for validation to a committee of experts in the field of education. Ambiguous, imprecise or unclear items were rephrased. Both the CHAEA and the CCE were translated into Romanian by bilingual translators. 169 questionnaires were distributed at the Centers by the teachers and 20 were sent and answered by e-mail. In December 1989, the communist regime collapsed a turning point in the Romanian culture and society. The alternative hypothesis of this study claims that the changes in the educational culture after 1990 have had an influence on the individual learning styles. The null hypothesis assumes that there is no such an influence. To bring to light the relation between the variables educational culture and learning styles during language learning, both periods before and after 1990 were contrasted with two separate samples obtained at random, one from each of the two periods. The educational culture is limited to the one received under the compulsory education system, so the seven first years of an individual life do not count in this study. Both samples were distributed and analyzed according to the respondents´ birth decade establishing the cutoff point in the year 1980. Those who were born after 1980 experienced most of their education after the revolution, as access to primary education starts at the age of seven. By organizing the data in this way, this study intends to find differences between periods. To determine the dominant learning style, the CHAEA questionnaire was used. Each score represents a level of dominance/preference in each style (high, medium, low) according to their position in the general scale. An individual´s dominant learning style is the one which presents the highest score. Respondents mark each item by showing approval or disapproval. Approved answers score one point, disapproved answers do not score. The statistical analysis was done firstly by running an ANOVA test to determine if there was a significant difference between periods considering the dominant learning style in each period. The question whether there has been a change in the dominant learning styles of the informants after the 90s is key before establishing a relation with the educational culture. Secondly, the statistical analysis of the potential relation between the variables educational culture (measured through the CCE), the learning styles (measured through CHAEA) and periods of time was carried out by assessing the level of each dimension before and after the 90s through the analysis of the parametric data (SD and mean scores). This analysis is aimed to find differences in the level of the dimensions between periods. by correlating the three variables (period of time, learning styles and educational culture) using Pearson´s correlation. by using the Student´s t test. In the following sections, we will present the most salient results of our study, beginning with the general differences between dominant learning styles before and after 1990, and followed by the analysis of the relation between learning styles and educational culture. This analysis will be presented in two stages: first by learning styles and then by dimensions. Generally speaking, there is a slight difference between learning styles of the two periods. More in particular, the one-factor ANOVA test shows significance levels between both periods of time (before and after 1990) within theorists and reflectors (p= ,012 and ,000 respectively, see Table 1). Table 1. One way ANOVA test learning styles before and after 1990. These differences indicate a significant decrease in the percentages of these styles after the fall of the communist regime, which may be a consequence of the change of paradigm in the education system moving from a rote theoretical learning to a more practical one, from a teacher-centered methodology to a learner-centered approach where students were allowed to play a more active role in their learning process. Although there is no statistically significant difference between periods within the activist group, Figure 2 allows us to see at a glance that the proportion of activists after the 90s doubles the proportion of activists before the 90s. The frequency distribution within each period (Table 2) shows also the dominance of the group of activists after the 90s (35,1%). On the other hand, the total decrease of the percentages within the reflectors and theorists after the 90s (-8,7% and - 7,8%, respectively; together -16,5%) is almost the same as the increase of the percentage of activist after the 90s (+16,3%). Between pragmatists there is hardly a difference. This shift in the figures may indicate the shift in the educational paradigm mentioned before. Table 2. Contingency table, dominant Learning Style (LS) before and after 1990. In each Learning Styles (LS) section we have put together the CCE items which got significant scores by the informants with that particular style. As it is impossible to explain all significant items in this article, in the following section we will analyze a selection of them grouped by dominant style (LS). CCE items are indicated by the letter B plus a number (see Table 3). In general, according to CHAEA, individuals whose dominant learning style is the active style, contribute with new ideas, look for new experiences and are often guided by their intuitions and emotions. It seems unlikely that this kind of behaviors took place normally within the Romanian communist educational system which marked the procedures, tasks and activities to be followed. A routine system was imposed with a fixed order within teaching planning. Education was highly regulated and “the curriculum was strictly controlled, as all-important decisions were centralized” (Reisz, 2006: 74). In the post-revolutionary period a new phase is initiated in which new programs and methodologies are intended to grant more autonomy to students and to diminish teacher-control on the learning process. Item B11 is intended to measure these behaviors. The active style assumes a preference for oral expression. In the post-revolutionary period, an increase in oral communication and participation of students occurred. These are typical behaviors for active students. This change is indicated by item B14 (Table 5). Students with a dominant reflective style prefer to listen rather than talk and often assume a secondary role within the group. This kind of behavior agrees with the culture of the communist classroom but contrasts with the post-revolutionary period in which students have higher levels of active participation and autonomy. Results in this study show a correlation between reflection, oral participation and period of time, revealing an increase in students’ oral participation in the period after the revolution (items B4 and B12). There is a significant difference between reflective students´ scores between both periods (Tables 3 and 4). Reflective learners prefer minute analysis rather than intuition and make several revisions before the final draft of a project. They are cautious and perfectionist. Maybe for this reason they have noticed the changes in the 1990s, when the opening up of the system led to innovative educational situations (item B18 in Table 4), but which were often lax and even chaotic as there were no clear programs or guidelines and teachers did not know exactly what to do. Theorist students are good at designing models, theories, identifying value systems. They are synthetic and systematic. The significant items marked by this group of students are especially within the field of theoretical assumptions. Concepts such as the social value granted to lifelong education (item B2), school failure (item B25), or analytic versus synthetic instruction (item B34) have received significant scores from this group indicating significant differences between periods (Table 5). Theoretical students try to come to clear ideas and conclusions and are convinced that reason and logic should prevail. Pragmatic students, in general, like to experiment and try out the latest innovations and ideas. This trait is reflected in item B1 which measures the social value assigned to tradition versus innovation. They are doers, so they expect to learn how to do things (more in the post-revolution period than in the communist one) (item B3). Pragmatic students like to have their say and have frank, straightforward discussions/exchanges. They may feel uncomfortable when, in the classroom, they are not allowed to express themselves due to the power distance between teacher and students, especially if their ideas and opinions do not coincide with those of the teacher (item B13). After 1990, teachers are less expected to have all the answers than in the previous period (Table 4). They are also expected to use a less formal and academic language (items 16 and 17). CHAEA states that pragmatic students think that it is important to get to the point, to the heart of the matter quickly. In this section, significant items of the CCE are grouped by dimension, mainly focusing on the analysis of the cultural features and patterns in both periods of time. Item B1, which is intended to measure society´s association towards tradition and innovation, shows a significant correlation with pragmatic style. Pragmatic students perceive a more positive association with what is new in the period after the revolution in the society overall. Table 5 shows the mean scores in both periods: the period after the revolution set the trend towards a more individualistic society ( = 2,27 before the 90s and 3,50 after the 90s). Individualistic societies have a positive attitude to trying out new things (Triandis, 1994; Hofstede, 1997; House et al, 2004). Table 5. Parametric data of the items from the CCE and CHAEA questionnaire before and after 1990. Item B2 is intended to measure attitudes to lifelong learning. This trait correlates with theoretical learning style and period of time. The youngest students score on positions significantly closer to the individualistic pole, i.e. towards the option that values lifelong learning. The comparison between mean scores shows a point of difference on the scale between the two periods ( X= 2,50 before 90 versus 3,50 after 90). Item B3 presents a significant correlation with pragmatics style and period of time. Pragmatic students after 1990 expect to learn how to do things more than in the previous period obtaining closer scores to the collectivist pole. After 1990 the teaching methods changed, by implementing more participative and heuristic activities like problem solving or carrying out experiments. Learning by experimenting is part of the new philosophy within the curriculum. At the same time group techniques were also introduced like role play, case studies or simulations urging students to play a fundamental part in their learning process. The communist education system was in general a type of theoretical learning. Education was characterized by simple regurgitation of learned text and rote learning (Misco, 2008). After the fall of the regime, the new curricula tried to compensate gradually the lack of practical training in the previous period, by establishing methodologies which allowed more room for experimentation and a more learner-centered training. Item B4 is intended to measure the oral participation of students. It has received high scores from reflective students. The mean score for the communist period (X= 1,94), passes on to central positions (X= 2,67) in the period after 1990. This central score could indicate that we are in a transition period in which both realities alternate. There is a relationship between reflection and oral participation, and between oral participation and collectivism, as Martínez (2002) claims in her research on the influence of Japanese culture on learning styles. She administered CHAEA to 300 students of Spanish and revealed that the highest average score corresponded to the reflective style. Martínez (2002) noted that Japanese students of Spanish remained passive in class and did not speak up on their own initiative as they did not wish to stand out from the group, having grown up in a collectivist society. Moreover 'they are faithful to the strongly hierarchical society in Japan and therefore have a clear sense of the differences between themselves and the teacher which is expressed by waiting to be asked in order to participate' (Nozaki, 1993, cit. Martínez, 2002: 617). Similarly in the communist collectivist Romania, reflective learners in the study believe that students spoke mostly if they were asked by the teacher. In item B11 activists and reflectors´ scores are closer to the left pole on the scale (low power distance) in the period after the revolution. Items B12 and B14 measure patterns of communication in the classroom. There is a significant difference between periods. Reflectors and activists have obtained closer scores towards the trait which indicates low power distance ( X= 3,34; 2,44) after the 90s, showing a tendency towards higher levels of students´ oral participation in the classroom. It is worth pointing out the mean scored during the communist period ( X= 4,25) indicating a high power distance with a low SD of 1,055. In the period after the revolution, scores drop ( X= 3,21) but maintain a high standard deviation (SD 1,805). This score again could indicate the transition between the two education systems where behaviors and attitudes from both periods concur. In language classrooms in societies with high power distance, the teacher shows the paths and actions to follow. There is not much room for individual initiative. According to Joy and Kolb (2009) this kind of society does not grant individuals the freedom to do what they want or to make their own decisions. By contrast, in low power distance societies, the education system is student-centered and encourages questioning and experimenting (Hofstede, 2001). The members of such societies do not hesitate to engage in active experimentation (Joy & Kolb, 2009). 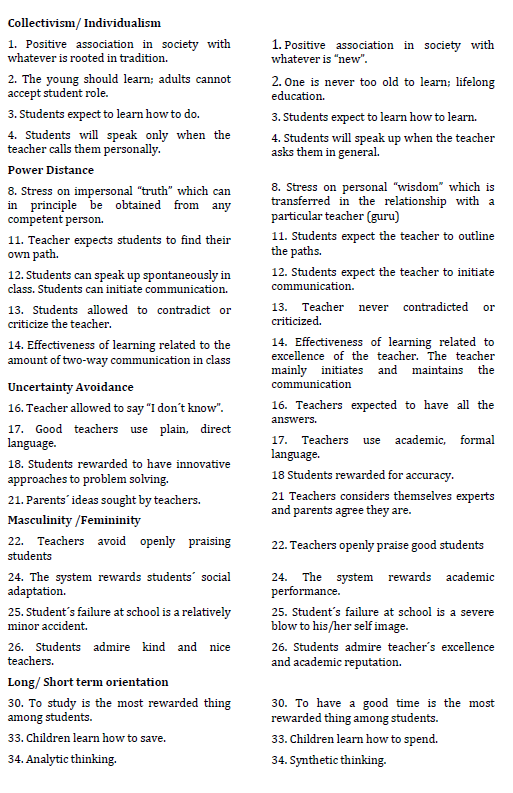 Item B13 relates to items B16 and B17 in which beliefs about the figure of the teacher are also discussed. These measures correlate significantly with pragmatic learning style and period of time and show negative correlations, which sets the trend towards a lower level of uncertainty avoidance (left pole on the scale). It is relevant to point out to the mean score for the communist period (X= 4,50). This score leaves no doubt about the role that, at least in theory, teachers should play as information carriers and providers whose knowledge, expertise and excellence were taken for granted. This rating is further supported by a SD of 0,905, the lowest in the table. Although the mean score in the 80s and 90s has dropped significantly ( = 3,43), it still shows a medium level of uncertainty avoidance. The mean difference between periods is significant. Item B17 is intended to measure the type of language used by teachers. There is a significant change in the post-revolutionary period towards a plainer and less academic language (lowest level of uncertainty avoidance: X= 1,43). The degree of structure and order in learning languages and the preference for correct answers in problem solving may be indicative of the level of uncertainty avoidance in a culture (item B18). In societies with a low level of uncertainty avoidance and in the field of education, open learning situations are preferred allowing room for original, experimental and unconventional ideas. Children are encouraged to experience new situations. There is less resistance to change and innovation (Hofstede, 2001). By contrast, individuals from societies with a high level of uncertainty avoidance have a tendency to think that what is different is dangerous. Breaking rules is not tolerated (House et al. 2004), tasks with clear and fixed results and unambiguous guidelines are preferred. Teachers and students prefer situations and problems with one correct answer and accuracy is rewarded (Hofstede, 2001). Hope (1990) and Yamazaky (2005) found evidence of a positive relationship between uncertainty avoidance and reflection. Mean scores from theoretical and reflective students show a significant difference in the two periods for item B21 which is intended to measure parent´s involvement in the educational. In Romania, the new education system after 1990 gradually incorporates and allows for greater parental involvement in the education process through their association and participation in the Boards of schools. This openness to parent participation in the system involves a change in attitudes toward the establishment of irrefutable truths (usually in possession of the academic authorities) and introduces a necessary social dialogue in an educational environment that aims to be more flexible and democratic. Education in Romania has evolved into a highly competitive system in which access to the best colleges is constrained by the level of qualifications. Colleges are ranked by prestige. Access to a good high school can make an important difference in training and in the academic career. In such a context, praising the best (item B22) is part of this culture of "excellence" in which performance has priority over social adaptation (item B24). In this sense, and considering competitiveness as a male trait (Cuadrado, 2007; García 2014; Tellez & Verdú, 2011), one could say that the Romanian educational system has become, in this regard, less feminine in the period after the revolution. These items correlate significantly with both reflectors and activists and period of time (reflective students in item B22 and activists in item B24). In both items there is a change towards medium-high/ high mean scores in the post-revolutionary period which shows a tendency towards a more masculine educational system. Paradoxically in this competitive environment, failure in school (item B25) appears to be less important after the 1990s than in the previous decades. Theorists differentiate between the two periods. In the communist period, the mean score is positioned in the upper middle segment of the scale ( X= 3,92) while the period after 1990 drops to a central score ( X= 3,16). Gradually, after 1990, education services were diversified and private schools were established. New universities (24 in two decades) and new specialties were created in vocational training. All these options offer new possibilities when it comes to potential educational failure and provides for more freedom and choices within a more tolerant and relaxed sociopolitical setting. In item B30, mean scores in the post-communist period (except for theorists) show significantly higher scores towards the right pole of the scale which indicates that having a good time is the most rewarded thing among students (low level orientation trait). The high levels of significance in three of the four LS point to the widespread perception of this value in society. Since these are central positions, another interpretation may be that both standards coexist among younger generations. there was a massive amount of information that students had to memorize. Teaching was quantitative. An extensive and detailed training content was intended. Results from the theoretical students in this period show a score in the middle segment under ( X= 1,96). After the Revolution new approaches are gradually developed towards a more interdisciplinary methodology that can lead to more global thinking strategies. The mean scores in central position ( X= 2,76) can be interpreted, as before, as an alternation or coexistence of both realities. participation and period of time, revealing an increase in students’ oral participation in the period after 1990.
fundamentally theoretical and content overladen. Our results indicate that education was more analytical than synthetical. participation and autonomy in the learning process. characteristics of a certain style received consistently high scores between the two periods for that style. show a preference for speaking up and participating while reflective students prefer to listen and adopt a more passive role). perfectionists), or for relying on as many sources of information as possible (item about seeking parent´s feedback and ideas). straightforward language by teachers, all aspects typical of the pragmatic style. aspects of the educational culture that relate to their own learning styles whether favorably or unfavorably. Aleida, G., González, A. (2010). Estilos de aprendizaje de los estudiantes de la universidad de Sonora, México. Estudio de caso. Revista de Estilos de Aprendizaje 6, (6). Alonso, C. M., Gallego, D., Honey, P. (1994, 1997). Los estilos de aprendizaje. Procedimientos de diagnóstico y mejora. Bilbao: Ediciones Mensajero. Anido, M., Cignacco, G., Craveri, A. (2009). Algunas características del perfil académico del alumno en los primeros años de su formación básica. El caso de una facultad de ciencias veterinarias. Revista de Estilos de Aprendizaje 3, (3). Auyeung, P., Sands, J. (1996). A Cross Cultural Study of the Learning Style of Accounting Students. Accounting and Finance, 36: 261-274. Barmeyer, C. I. (2004). Learning styles and their impact on cross-cultural training: An international comparison in France, Germany and Quebec. International Journal of Intercultural Relations, 28: 577-594.